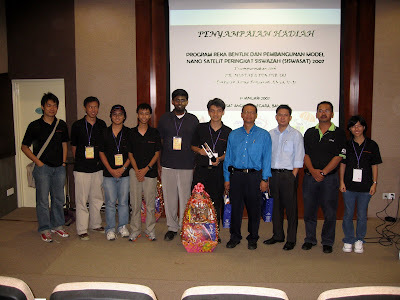 These words are heard on 31 January 2008 at National Space Agency, Banting before Multimedia University team launches their SiswaSat and eventually won the second prize in the competition and RM3000 is awarded. CanSat has to transmit telemetry data from the sensor on board to the ground station during descent time. CanSat has to withstand the impact of the landing and still functioning. “MMUSat Weather Monitoring System” is the name of CanSat developed by a team of 6 MMU students. They are Yap Wei Wern, Sun Tze Yun, Kwa Wee Chiang, Pavithran Nair, Soon Jun Sheng and Ho Ce-Yi from Faculty of Engineering working under the supervision of Dr. Mohamad Yusoff Alias and Mr. Yap Wen Jiun. MMUSat is designed as a weather monitoring satellite and incorporated with a temperature sensor, a light intensity sensor, a methane sensor and a wireless video camera. MMUSat successfully fulfills all mission requirements and demonstrates the capability to obtain and transmit acceleration data, temperature data, methane concentration and video captures. The measurement of methane concentration shows MMU team’s concern about environmental issues as methane is one of the greenhouse gases. The 1st prize is won by UNISEL which is awarded RM5000 and the 3rd prize is won by UIAM which is awarded RM1000. UPNM won the best design award.